In Burmese and English with English subtitles. Study areas: Burma, Video Journalism, Social Movements, Technology, Asian studies, South East Asia. Burma VJ: Reporting from a Closed Country is a story of journalism at its most powerful moments: the times when people become so enraged that they become empowered, when the video camera, the still image, one’s persistence and sacrifice merge to tell the stories that no one else can hear and tell – or maybe that some people don’t want to hear. Certainly, Burma VJ tells a story that many in power within that country don’t want told. 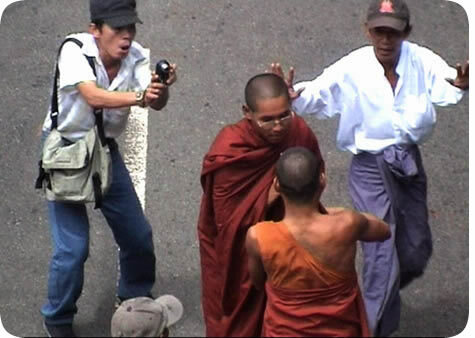 Since international journalists are tightly restricted in Burma (currently called Myanmar by its leaders), these native reporters – often left to hiding Sony handhelds and cell phones in armpits, bags, or under brush – shoot images of protests and police brutality that outsiders can’t get. The video is then smuggled outside the country or transmitted on the internet, edited, and returned via satellite for clandestine broadcast in Burma. Burma VJ follows some of these 30 undercover video journalists working for the exiled Democratic Voice of Burma television and radio network. The journalists often operate in chaos, and Burma VJ reveals the lengths reporters must go to in order to cover the news while in constant fear for their freedom and lives. In one scene from August 2007, for example, protestors clash with government agents who pull at the dissidents, turning their shirts into rags. Police are videotaped beating citizens, their actions leaked and broadcast on CNN and the BBC to be seen around the world. It is a triumph for journalists, but one that doesn’t go unpunished. As a look at the sociology of newswork, this documentary presents an opportunity for a discussion about the role of journalism: Are these objective observers or social activists, and does time, place and culture influence that answer? One scene shows a reporter talking to a monk. He tells the religious leader that protest against the government could become even more powerful if the monks invited the public to join. After a moment’s thought, the monk agrees. He says they will begin a new movement in the protest by inviting others to join them. “That’s exciting news,” the reporter says. Another reporter later helps lead a march through the streets with the monks. Because of such instances, Burma VJ’s narrative becomes just as much about understanding the complexities and creation of social movements as it is about emerging hyper-local international journalism, the meanings behind access to technology, and the standards and practices of independent filmmakers and journalists. Burma VJ is also a commentary on transnationalism. Low-end video cameras and the use of Google Voice to communicate, both through audio and text chats, allows journalism to take a fundamental role in citizens’ attempts to claim – or to reclaim – their society. At the same time, we see the need for global media companies to legitimize the work of these semi-gonzo journalists, without which the reporters’ efforts would likely not lead to international involvement. Indeed, this film ends with a nod to how Democratic Voice of Burma became an underground yet international voice again in 2008 following a devastating storm that killed some 10,000 people. Their videos and reports allowed the world to see a country reeling without governmental assistance. Appropriate for high school and college students, this film can sometimes be difficult to watch. Jolting and unfocused video, shot by handheld video recorders, create a sense of being there amid smoke, gunfire, anguish and conditions of political oppression. Still, this film is careful to limit explicate scenes of murder, though it does not shy away from showing the brutality of authorities and conflict and may awaken in some students a realization that such conditions continue to exist within many societies. Burma VJ can be useful in civics classes, journalism courses, history and world affairs classes. Finally, while the documentary orients the viewer to a basic understanding of what led to events shown in the film, a short historical and geographic lesson may help. Robert E. Gutsche Jr. is a Ph.D. student in the School of Journalism and Mass Communication at The University of Iowa whose research interests includes the sociology of newswork and visual communication. Democratic Voice of Burma upon which this documentary is focused is online at http://www.dvb.no and on Facebook at http://www.facebook.com/dvb.norway. Burma VJ: Reporting from a Closed Country is available at http://burmavjmovie.com, Oscilloscope Laboratories http://www.oscilloscope.net/films/store and on www.amazon.com.